It’s a lovely time of year here. Here’s our old buddy Mr. Moon rising over Columbia Park one recent evening. I have some random bits and pieces for you today, because, well, it’s been kind of a random couple of weeks. We had another cycling event near here, this time with an actual sewing connection! The Cascade 1200, a 1200-kilometer randonnée, began at the Space Needle in Seattle on Saturday, June 23rd. The cyclists traveled across Washington state in a big loop, finishing up in Snohomish on the following Tuesday. My part in that–not being the sort of person who rides a bike for 750 miles at a stretch–was to set up a control in the little farming town of Mattawa so that the cyclists could get water and food out there after everything closed down for the night. My partner had originally intended to do the ride, but later decided against it and came out to help me with the control. Here we are all set up under a street light with a cooler full of drinks in the back of the car, coffee brewing, and me making sandwiches out of frame on the right. Anyway, the sewing connection is this: all the volunteers were wearing event tees, and I hadn’t planned to because it fit me like, well, like this. It was too long, too tight, and the neck was too high. But then I noticed all the pictures on Facebook of the volunteers wearing them, and I started to hear a little voice in my head: psst . . . you know you could alter it . . . c’mon, it won’t take that long . . . . So the morning of the day we were supposed to go out to Mattawa, I decided to do it. No, it doesn’t go, but at least it’s busy and cheerful. I cut a few inches off the bottom of the shirt and cut off the side seams from armpit to bottom; the sleeves and bust on this fit fine, so I only had to worry about adding width to the waist and hips. Using a rotary cutter and mat, I cut two wedges of the jersey, 1/2″ wide at one end and 4″ at the other. I’ve been hearing for a while now that cutting knits with a rotary cutter is the way to go, and it worked surprisingly well on this fabric. I was worried that the knit would shift around or not cut cleanly, but no problems at all. Then I inserted the wedges into the side seams and pressed them. I cut off the neck ribbing maybe 1/4″ below the stitching and sewed on some binding. Quick hem and I was done–literally about 15 minutes before we needed to leave for Mattawa. It still looks a little lumpy, but I AM lumpy, so that’s gonna happen. It was a rush job, and most definitely not anywhere near being my best work, but it’s much more comfy now and just feels a lot more like ME. I really intended to only wear it that one time, and then maybe use it for exercising, but I’ve found myself wearing it a fair bit. The fabric is so soft, and the shirt is so comfortable now, that it’s just really nice to wear. More importantly, I’ve been wanting to get into upcycling for a while now, and this alteration is my first tentative step in that direction. More to come on that–I’ve actually got a second alteration project to show you, but I’ll wait until I can get some decent pictures. In the meantime, here’s something interesting to consider. I’m running a sew-along on Facebook again this July-August in the Sew-Along Dinner Date Dresses group. I agreed to do the sew-along last fall, but it took me the longest time to find a designer dress pattern that I thought might work for larger or apple-shaped women. This is one weird design! There are no side seams, just a front and back that extend and have ties; you can tie it in the front or back. I have no idea if this is actually going to work, much less look good on me, but I think it will be fun to find out! So if you’re on Facebook and want to try this very weird pattern, join us! It’s an easy pattern, but there are opportunities for practicing skills like making bias binding and doing narrow hems. There aren’t many steps in this pattern, so making it over a two-month period will produce a nice, easy pace that won’t interfere with all your other summer fun. Have a great week, everybody, and take a little risk if the opportunity presents itself. You can always re-use your fabric for something else. Busy week here, and more busy times ahead! Plans are being made for spring and summer travels and activities, and there will be a fair bit of both. Much sewing to be finished first. Let’s see what’s been happening. Things are greening up in Columbia Park. Look how high the Columbia River is here–a few warm days plus rain has led to some flood warnings for the Yakima River. Yep, over 90 on Thursday, then a spectacular lightning storm that night. Quilting continues, and I had to get some new marking tools and thread. Sewing projects continue to multiply at a somewhat alarming rate. I found this nifty textured blue knit remnant in the stash that I can combine with the yard of cotton/lycra I got the other day. Picked up some black duck for another cycling cap (oy, this guy and his boring black clothing). Hunting for fabric for another cycling jersey, too. Favorite dinner of the week: Chicken Enchilada Soup. I obviously need a food stylist to arrange my avocado perfectly for me, but this was delicious. I swear he doesn’t actually sleep ALL the time–just during the day. According to my partner, Pooh and Shelby do all their playtime in the middle of the night. Then they wait just outside the bedroom door for him to get up early in the morning so they can jump on the bed for cuddles with me. Many thanks to Natalie of Threads and Bobbins for hatching the idea of Sunday Sevens and giving me an excuse to take (even more) cat pictures. Baby geese! Many, many baby geese! I was too fried to post last Sunday when we got home from Olympia, so I’ll try to catch up on the last couple of weeks in this post without burying you in zillions of pictures. Last weekend was the annual Northwest Fleche ride, a one-way (fleche=arrow) bike ride to Olympia, WA. I drove up to meet my partner and his team at the end of the ride and participate in the March for Science at the state capitol in Olympia. All of us old hippies on the way to the capitol. All of these marches I’ve been to since January have been majority women, often majority middle-aged and older women. We know a bully when we see one. A few short speeches before the March. It rained BUCKETS as I was driving over there and searching for a parking place, but the rain petered out as I was walking to the capitol, thankfully. Off and marching. Estimated attendance 5,000 people, which I thought was pretty impressive considering that nearby Seattle also had a huge march. We came home on Sunday afternoon to find that my Nature’s Fabrics order had arrived! I waited until they had a discount code available for members of their Facebook group, then used that and the gift certificate I won a while ago. I got these two cotton/lycra knits, plus two heavier cotton knits for leggings. I LOVE THEM. Tuesday night clean-out-the-fridge-before-I-go-grocery-shopping pizza. Sauce was a weird pesto made with leftover parsley, mint, tarragon, basil, and some broccoli. Covered with random bits of veg, some ham that needed using, and various cheeses. A little strange, but we ate it. I was inspired by this lovely post over at Mona’s place and filled another bag of clothing for the local shelter (partner also contributed). The white bag in front is filled with 8 1/2 yards (plus some large scraps) of fabric to go to SCRAP. Yay! As always, all credit to Natalie of Threads and Bobbins for coming up with the idea for Sunday Sevens and giving us an excuse to talk about (very) random pizzas. Have a great week, everybody, and I hope that you find some beauty in the world this week. Sometimes it’s hard to find, and sometimes you have to make it yourself, but it’s there. Hang on to it, and each other. Thank you, Mr. Anonymous Cyclist Guy, for providing a photographic metaphor for my June. I just checked and I haven’t posted in a month. That’s probably because June was a big old steaming pile of shite. First, partner’s knee blew up, followed by many doctor’s appointments and the scheduling of surgery for late July. This meant that basically his whole summer of cycling now had to be cancelled, including the two 1200k rides he had planned and the accompanying travel and fun times. Fun times in general are going to be in short supply for the summer, as he can’t walk very far without pain and swelling. A very large bummer for both of us. This was followed by financial trouble, computer trouble, more medical trouble (mine this time, and thankfully minor), and, inevitably, relationship trouble. Near the beginning of all this, my doctor suggested I go off my blood pressure meds; needless to say, I’m back on them. But, as I put it to the doctor the other day, I am coping furiously. One BIG problem was resolved on Wednesday, and progress is being made on all of them. I apologize to my online friends for my absence and lack of comments on your blogs–I’ve been reading what you’re writing, but I haven’t always felt able to write anything positive (and positive is what I would like to be with online friends). Hack the Blanc again to make a colorblocked tee. Observant readers may notice that these aren’t the knit scraps that I planned to use. That’s because I had had an idea to make a sort of a muslin (inspiration), and I wasn’t quite sold on it, so I was going to use scraps I wasn’t all that crazy about. But then I came across this post (scroll down to the black tee with the flowered skirt) and I came up with something that I knew would show off this flowered knit, which I LOVELOVELOVE. The white and flowered knits were bits and pieces from SCRAP; the green was from the stash, a remnant of a project made so long ago that I don’t even remember what it was. The white turned out to have some stains, including fold lines, so I used it with the wrong side out. Also, since it was in somewhat smallish pieces, I had to piece the back again, so I made it a design feature. 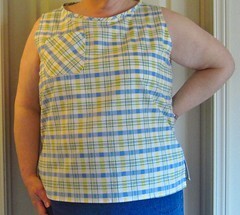 I’m a bit cranky about the fact that I forgot to adjust the neckline to make it narrower after the first Blanc I did. So it’s a bit wider than I would like, but it’s wearable. And the quality of these fabrics is really nice, so the top is very soft and comfy. Win! I expect to take another stab at colorblocking when fall gets closer; I picked up some pretty cool fleece and sweatshirt knit pieces the other day at SCRAP and I’ve got some more ideas cooking (more inspiration is here). Done! And, man, is this pattern a BEAST. Lot of seam ripper action on this one. I had to redo the tab on the outside (picture with Shelby above) and my wrist strap turned out to be a bit messier than I would like, but the biggest problem was the final seams attaching the pockets to the zipper. No matter what I did, I just could not catch all the layers in the seams. I wound up having to slip stitch some of the edges by hand, and I’m so glad I did that rather than ripping it all out again. The pattern recommends duck or denim for the “base” that all the pockets are attached to (see the black denim I used in the center of the pic above). I think things would probably have been easier if I’d used a lighter-weight cotton for that; you don’t really need the extra heft of duck or denim with all those bajillion layers of fabric in the pockets. And then, after all that, my phone doesn’t fit in the outer pockets! I can just zip it inside the wallet, but I’m a bit disappointed. Finish my black skirt. I came across this tutorial for a shirred skirt and used it to re-cut the black fabric from my failed wrap skirt. This was a new technique to me and it’s pretty cool–you just put elastic thread in your bobbin, sew a bunch of rows, and press to make the thread shrink up. Seems like it would be a super fun project to do with a kid who’s learning to sew. I ordered the thread Melly suggested in the post and it worked just as described. My sewing machine seemed to cope all right with the elastic, much to my surprise. The biggest problem I had was my bobbins running out, as the thread is a bit thicker than regular thread, so you can’t actually get that much of it on a bobbin. I wound up using the entire spool for the skirt. In the meantime, though, I leave you with some pictures from Thursday’s walk around the fishing pond in Columbia Park. No birds this time, unfortunately, but there are trees and wildflowers, anyway. Oh, and the two pictures up top are from the Cascade 1200k bike ride; since my partner wasn’t able to ride it, he helped me run the control at Potholes, a barely-there town near Moses Lake. We set up in the 76 parking lot and fed about 80 cyclists pb&j sandwiches, homemade cake and blondies, soda, chips, and bananas. I hope the weekend is treating you well. Hello July! Make-A-List Monday is an idea that I borrowed from Sarah Craig over at Confessions of a Fabric Addict and I thank her for inspiring me to try it! Skipped last week, but I’m back! And I have lots to show you! First, let’s see how I did on my 5/11 list. This is the Noodlehead Carkai Gatherer Bag and I love how it turned out! Nothing purchased for this bag–fabric, piping, hardware, button were all from stash. For the front closure, I had hoped to use one of the very cool glass beads my sister’s given me over the years, but I just didn’t like how they looked with the flap fabric, so I used a simple gold-colored shank button instead. I modified the inside pocket a bit to use the very last of this black Laurel Burch fabric, and divided it with lines of stitching. The pattern includes a 1/2″ strap; I kept that width for the loop on the bag, but widened the shoulder strap to accommodate my hardware. I honestly have no idea where these hooks came from–taken off another bag, maybe?–but I like them! Cut out my new wallet. Done! So many little pieces! I’ve been working on it off and on and I’m coming down the home stretch. You guys, this pattern is INSANE. The designer calls it expert level, and she is TOTALLY CORRECT. Don’t get me wrong–it’s a well-written pattern and has lots of pictures to help you out. But the level of detail on this is just nuts. Finish the cat scratcher and get the class proposal ready to go. The fabric on the outside is very cute close up (looks like multi-colored confetti), but doesn’t show up very well against the carpeting. I have lots more cardboard cut for the next one, and will use a brighter fabric. Do better on healthy eating and exercising. Doing better on this. I still really need to get out and walk more, and it’s been hard to get myself out there, but I’ll continue to work on it. I also made a muslin this past week. 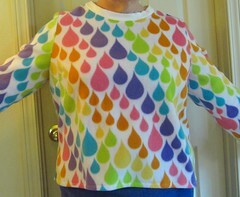 This is the Blanc Shirt pattern from Blank Slate Patterns (available for free when you join their Facebook group). It’s a simple tee pattern, sized for knits, with only two pattern pieces. However, me being me (read: DIFFICULT), I made it with a soft, stretchy rayon that I got at Goodwill the other day for $ .99. And, of course, OF COURSE, I was 1/3 of a yard short on fabric, so I hacked the back. I cut the back pattern piece in half at the waist, cut the bottom part on the fold of the fabric, and cut two separate pieces for the top part. 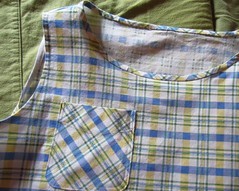 I sewed the two top back pieces together, folded over to make a faux band, topstitched, and sewed buttons on it. I also added side slits, as the fabric didn’t have quite enough stretch and the fit at the hips was a bit tight. Result? I’m very happy with this blouse and it will be SO nice when the weather gets hot, which will be this week–95F predicted! So, plans for this coming week. That ought to keep me busy. I have some outdoorsy photos for you, but I think they may need their own post. Have a great week, everybody! Columbia Park–fishing pond is behind me, Blue Bridge to Pasco just visible on the right. The week has been something of a mixed bag, productivity-wise. Let’s see how I did on last week’s list. Make a tote bag for SCRAP. Done! Took much longer than anticipated, though. Here’s what I started with, a Fabric Pack consisting of a focal piece (an embroidery sampler, in this case) and some coordinating fabric scraps: some dark brown wool suiting, green polyester felt, yellow and white striped cotton, gold synthetic drapery-type fabric, blue stretchy nylon (yuck), pink cotton knit, green and white striped cotton with animals on it, some yellow and white fabric ribbon, two blue flannel quilt blocks, and about half a yard of pink cotton with lighter pink stripes. My goal was to use at least a little of everything, but what a motley assortment of stuff! I washed everything first–I never make bags that aren’t washable, so all the components had to be–then cut the sampler in half and trimmed the halves to be even. The gold drapery fabric was already cut in strips, so the wider one became the bottom and sides, and the thinner one became the handles. The pink stripe was the only big piece I had, so that became the lining, and I set the pink knit aside for the bottle holder. All the other scraps were cut into 1″ strips and pieced together. The bottle holder came out so cute! This is two layers of cotton knit, with the ribbon used to cinch it tight. The stretch in the fabric is side to side so it won’t droop. I am definitely going to use this idea again! The only supplies I used from the stash were thread and a little bit of white cotton that I cut into strips and used to stabilize the blue nylon and make it opaque. This was a fun project! It was an interesting challenge, trying to get all those different fabrics to work together, some of them fabrics I’d never normally use. I think in some ways I chose the safest possible project for these materials, partly because I am planning to use this as advertising, so I wanted it to be appealing to lots of different people; I’d be very interested to see what somebody with a different crafting background than mine could come up with to combine them. Hmmm, well, yeah, about that . . . . This is a bit of a mystery, but it appears the skirt is too small. The pattern is meant for woven fabrics, but I used a knit, and cut the size that corresponded to my hip measurement. And somehow it’s too small? What? A Big 4 pattern cut to your measurements and it’s too small–when does that ever happen? Sigh. Nope, haven’t had time to work on it. I think I’m going to skip making a list for this week. Partner and I are headed to Oregon again this weekend (600k bike ride for him, exploration of those amazing Oregon parks for me!) and won’t be back until Monday afternoon. And there won’t be much time for crafting before then; if I do find some, it will be spent on the scratcher. Hopefully, I’ll be back next week with some fantastically GREEN park pictures for you, but until then, here’s a pic of Shelby with her new friend. This gray cat has been coming by in the evenings, and the two of them sit together for a while until she goes home. Every once in a while, one of them will hiss at the other in the laziest, least-threatening manner possible, the other one will ignore it, and then they’ll go back to sitting quietly together. A lovely, sunny spot in Zintel Canyon Park. And will you look at me doing my Monday post ACTUALLY ON A MONDAY?!? Okay, settle down now, let’s see how I did on last week’s list. Do the post about the cycling jacket. Figure out a circle skirt method that actually works. Done! At least, I think so. I did manage to successfully make one using some cheap synthetic knit from SCRAP. Now I’m wondering how taxing it would be to modify the technique slightly to make it work for a woven fabric. Hmmm . . . .
Prep at least one more hand-applique or embroidery block for our next trip coming up on 4/14. Done! I’ve now got three blocks ready to go. Try a circle skirt with a woven. I’m thinking the same technique with a little extra ease should work. Get my hand work done while I’m in Olympia over the weekend. Yep, that’s all I expect to have time for this week. But I have a few more pictures from last week. I whipped out a simple tote bag. I’ve been thinking I could use another grocery bag, and then I remembered I had this Craft Warehouse kit, a gift from a few years ago. And tomatoes are on the way! If you look carefully near the bottom left, you can see a tiny little green tomato forming there. I’m hoping this summer won’t be quite as hellish as last and that we’ll get some homegrown tomatoes. Afternoon temps are already up around 80F, so the plants are happy and thriving so far. And another couple of shots from Zintel Canyon Park. Have a great week, everybody, and hang in there–spring is coming! Pooh has had just about enough of this “staying awake” business. Finish the dress and do a post about it. Do a post about the cycling jacket. OY NO. I’m going to have to do this tomorrow if I want to link it up to the Finish-Along. Work on some more Splendid Sampler blocks. Done! I got these two finished; I’m in the process of cutting out fabric for the third, and a fourth is traced and ready for hand applique. That purple fabric is from a project I did many, many years ago, and I only have a few small pieces left, but I love it so much. Test at least one of the circle skirt tutorials I’ve found online in preparation for next month’s class at SCRAP. Done! And boy, has that been one big fustercluck. I think the instructions were screwy on the first one I cut out and the waist is HUGE on it. Then I mangled the second one because I broke my one ironclad rule of sewing–NEVER CUT FABRIC AFTER 10:00 O’CLOCK AT NIGHT. Every time I’ve broken this rule (coined by my sister), I’ve regretted it. The pieces of the skirt have been wadded up in a ball of shame ever since last weekend. Do the post about the cycling jacket. Maybe I’ll take pics of it on me? Probably better than nothing, but not by much. Figure out a circle skirt method that actually works. I’m really appreciating that hideous fabric I got from Freecycle right about now. Prep at least one more hand-applique or embroidery block for our next trip coming up on 4/14. And–best news of the week–I have a new friend that I’m going to be meeting up with for crafty time while I’m in Olympia! And I’ve got a few pics from the week’s activities for you. My mother got a new dog, named Regan, a rescued Chihuahua from the local Humane Society. She’s got a great personality–easygoing, affectionate, calm. My mother and I took her to the park and had a fun time. Took this pic on a different walk–things are greening up! Shelby assisted me with my sewing this week, as usual. You want to watch where you step in eastern Washington (taken at a rest stop between Yakima and Ellensburg). Well, I didn’t really intend to, but I managed to let two weeks go between posts. I’m still here, though, and still sewing, so let’s see how I did on my last list. This project made me a little nervous–I was worried the fabric was going to be a nightmare to work with, I didn’t know if the style would work on me, I was unsure about the sizing, etc. I cut a large, which was a bit of a risk, but the pattern has 5 1/2 inches of ease, so I figured that was plenty; I’m really glad I didn’t just go by my measurements, or this would have been MAMMOTH on me. And I wasn’t sure what finished length I’d want on this style, so I didn’t shorten the pattern, as I do with pretty much everything. I wound up cutting off 4 inches at the hem, and it’s still fairly long and drapey. Oy, I took a record number of bad photos recently. Blech. Everything went well until it came time to sew the hems. The bottom layer was hard enough, but I used my machine’s stretch stitch and rolled hem foot to get it done. The top layer was a major hassle, though; I made this hem narrower and, for some reason, the sewing machine just didn’t want to move the fabric along, and the stitches wound up tiny. Partway through, I decided to go to a regular straight stitch, as this part of the shirt really doesn’t need to stretch, anyway. So I’m a little embarrassed by the way the hem looks, but there’s no way I could rip it out without destroying the fabric. I’m still loving this top, though. It’s so soft and cuddly and purple! I’ve seen so many cheap and nasty jerseys, but this fabric is just lovely, and I love the swingy drape of the style. And it’s purple! Cut out the lining for the jacket. My partner and I had a table at the Bike Swap in Seattle last weekend, and I decided to make some little zipper bags to sell along with all the bike gear. Sold a few, gave one to my honey, and the rest will probably go to SCRAP to be sold there. That’s it. I’m tired of it and I want it finished so I can move on. I’ve been nervous about it, so I’ve been busily procrastinating away with other projects, but I need to just stop thinking about it and DO IT. I’ve decided that my reward for finishing it is going to be making my lovely Kaffe Fassett dress. And I’ll leave you with some recent photos from my travels. Yep, eastern Washington in February, complete with tumbleweed. This is a wheat field on a hill above Kennewick; partner and I were scouting possible bike routes. Interesting tree bark with moss from a walk with my mother near the fishing pond in Columbia Park. Snowy hills outside Ellensburg on our way to Seattle. Obligatory tourist shot, taken on a very soggy, gray Seattle day. Needed to get a little color in there! This is the Experience Music Project, which was very busy, despite the weather. Have a great week everybody, and I hope you’re feeling bright and sunny, even if the weather is gray where you are. Only two more weeks of February! Okay, so last week was supposed to be my organization/administration week? I’ve now decided I much prefer sewing weeks to organization/administration weeks. I was really fighting my natural tendency toward procrastination, but I did it, because, to be honest, I didn’t want to have to write a bunch of lame excuses in this post. Do a blog post on the Willara tunic. 2. Link up finishes to the 2015 Finish-Along–6 finishes out of 10! 3. Do a post for the 2016 Finish-Along. Done! Post is here. And I cannot tell you guys how happy I am to be making progress on getting some of these seriously ancient UFOs done. I like the mix of old and new projects on my list. 4. Deal with another pile of mending. Oy. Done (okay, all except for one sweater that I need to find a button for). Bleh. 5. Reorganize this corner of my sewing room/office/world headquarters. Done! All clean and organized and lovely! And I went through all my craft books and craft ideas torn out of magazines and weeded out all the junk–a bag of books is going to SCRAP and two bags of paper are getting recycled. I’m still fine-tuning where I’ve got things, but at least the crap I don’t use is gone and the huge pile of filing on the right is put away. So, the goals for this coming week. Put the damn button on the last damn item of mending. Dammit. Make the boxes for my desk drawers and get all the stuff in there. Finish the cross-stitch clock. The more I think about how old that is, the more I want it done! Check the fit on the wool jacket and cut out the lining. I’m a little bit nervous about dealing with the silk and making the lining, so I’m just thinking about it one little step at a time. Okay, I think that’s enough to keep me busy this week.